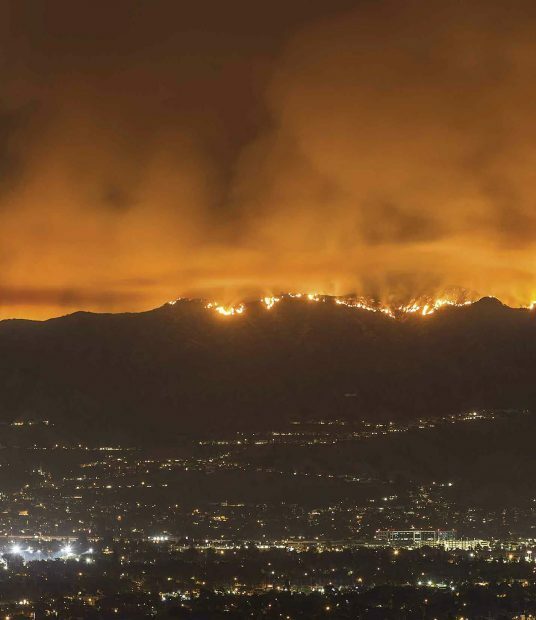 The 2017 La Tuna Fire in the hills above Los Angeles. Wild Los Angeles? That seems a contradiction in terms, for surely it is nearly impossible to locate nature inside the nation’s second-largest, and second-most-dense city. This metropolitan region, which gave birth to the concept of smog and sprawl—the two being parts of a whole—is now so thickly settled that it is almost fully built out and paved over. In the City of Angels, where even the eponymous river looks like an inverted freeway, there is no rural. Yet as concretized and controlled as Los Angeles appears, it does not stand apart from nature—any more than do small towns tucked away in remote locales. Consider the natural systems that over the millennia have given shape to this region. They are still at work. The most obvious of these is manifest whenever the grinding earth moves: Tremors radiate along the Southland’s weblike set of fault lines, an unsettling reminder that we stand on shaky ground. Even when (relatively) still, the landscape conveys an important message about how we live within and depend on the natural world. While strolling through Marston Quad, for example, look due north, focusing in on Mt. Baldy, which the Tongvan people call Snowy Mountain. The latter name is more evocative and revelatory of that 10,050-foot peak’s role as the apex of the local watershed. It is the source of the alluvial soils on which the College is built and of the aquifer that supplies much of the potable water that contemporary Claremont consumes. Perhaps the most dramatic signal of just how close Angelenos are to nature, and how compressed is the distance between where we reside and that space we imagine as “rural,” flares up every time a wind-driven wildfire sweeps down canyon or howls over ridge. We have endured too many of these fires over the past decade (unlike Northern California, which has a deficit of fire, SoCal has experienced a surfeit). Some of these conflagrations have been massive, like the Station Fire (2009: 160,000 acres) and the Thomas (2017-18: 282,000 acres); others have been much smaller, such as the Skirball (2017: 422 acres). Notwithstanding their differences in size, these contemporary blazes follow a historic pattern: Wherever people have gone, fire has followed. Beginning in the late 19th century, tens of thousands of residents and tourists hopped aboard the Los Angeles & Pasadena Railway’s parlor cars that took them straight to the Altadena station, nestled in the San Gabriel foothills. There, by foot, bicycle or the Mt. Lowe Incline, they headed uphill to frolic in the rough-and-tumble terrain. By the 1920s, with the ability to drive a car to local trailheads or up into the mountains directly, those numbers swelled to millions. Some of those engines sparked. Some of the many visitors smoked. The resulting fires, especially the infernos of the late teens and the 1920s, turned the sky black. Fires also erupted as housing developments, following rail and road, pressed out toward an expanding periphery. For those with the requisite means, the lure of a quiet suburban arcadia segregated from the disquieting urban hustle, yet situated close enough to commute between family and work, was a powerful magnet. Even as this white flight rearranged the city’s spatial dimensions, class interactions and racial dynamics, it proved incendiary in another sense. In the immediate aftermath of World War II, Army-surplus bulldozers leveled large lots for grand homes in the Hollywood hills and Beverly Hills, and furious firestorms erupted. For all its damage, then, the Bel Air Fire of 1961, which consumed more than 16,000 acres and incinerated 484 homes, was not unique. In subsequent years, blazes popped up in and around new subdivisions cut into the high ground above the San Fernando and San Gabriel valleys, and, later still, crackled through upland acreage overlooking the Simi and Santa Clarita valleys. Like the August 2016 Blue Cut Fire that torched portions of the rugged Cajon Pass, shut down Interstate 15, and forced upwards of 80,000 people to flee for their lives, the Thomas Fire disrupted freeway traffic in its furious run from Santa Paula to Ventura to Montecito and drove 100,000 from their tree-shaded homes. With fires come floods. Punishing winter storms, like those that pounded Montecito less than a month after the Thomas Fire sputtered out, can unleash a scouring surge of boulder, gravel, and mud that destroys all within its path. The resulting death and destruction—horrifying, terrifying—is, alas, also predictable. Since the late 1880s, some Angelenos have cautioned about the dire consequences of developing high ground, of turning the inaccessible, accessible. We have ignored those warnings at our peril—peril that climate change is accelerating as it intensifies the oscillation between drought and deluge, fire and flood. Further evidence that this most urbanized place is, and will remain, inextricably integrated with wild nature. Char Miller is the W.M. Keck Professor of Environmental Analysis at Pomona. His recent books include Not So Golden State: Sustainability vs. the California Dream and Where There’s Smoke: The Environmental Science, Public Policy, and Politics of Marijuana.